Description: Chicago Burlington & Quincy Railroad class O-5 5607 at Philadelphia, Pennsylvania on an unknown day in October 1930, photograph by Baldwin Locomotive Works, Chuck Zeiler collection. Number 5607 was completed by Baldwin in October 1930 (c/n 61523), retired in October 1960 and sold for scrap. Description: Chicago Burlington & Quincy Railroad 4-8-4 Class O-5 5607 presumed at Philadelphia, Pennsylvania on an unknown day in October 1930, photograph by Baldwin Locomotive Works, print by H. L. Broadbelt, Chuck Zeiler collection. Number 5607 was completed by Baldwin in October 1930 ( c/n 61523 ), retired in October 1960 and sold for scrap. 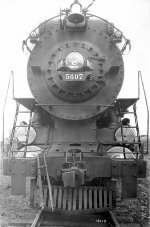 The first eight Class O-5's ( #'s 5600-5607 ) were equipped with Elesco ( Locomotive Superheater Company, LSCo, pronounced Elesco ) feedwater heaters. The rest of the O-5's ( #'s 5608-5635 ) were equipped with Worthington Feedwater heaters. Description: CB&Q class O-5 5607 at Philadelphia, Pennsylvania on an unknown day in October 1930, photograph by Baldwin Locomotive Works, Chuck Zeiler collection. Number 5607 was completed by Baldwin in October 1930 (c/n 61523), retired in October 1960 and sold for scrap. I have another shot of this same scene, with the shops touched out. I liked this shot better. Description: Chicago Burlington & Quincy Railroad 4-8-4 Class O-5 5607 presumed at Philadelphia, Pennsylvania on an unknown day in October 1930, photograph by Baldwin Locomotive Works, print by H. L. Broadbelt, Chuck Zeiler collection. Number 5607 was completed by Baldwin in October 1930 (c/n 61523), retired in October 1960 and sold for scrap. Number 5607 MAY have been the last complete locomotive delivered to the CB&Q by Baldwin, as well as the last new locomotive delivered with the Elesco Feedwater system. Subsequent 4-8-4's were built by the CB&Q from components supplied by various manufacturers (the boilers were supplied by Baldwin) and were equipped with the Worthington Feedwater system.